The people profiled in this book tell how you can create a positive life when you no longer can work, shop, attend church and public events or socialize without unpleasant, or worse, consequences to your health from low-level chemical exposures. 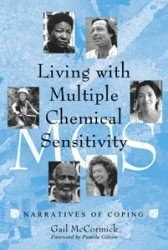 Living with Multiple Chemical Sensitivity is a collection of personal stories describing the lives and coping strategies of people with MCS from all over North America. It describes dozens of alternatives to the kinds of isolation and hopelessness that threaten people with this illness. Laced with inspiration, courage and humor, these stories dispel myths associated with people who have MCS, and will help others to articulate their own experience of the illness to family, friends, coworkers, and health care providers. Foreword by Pamela Reed Gibson of James Madison University. Appendices include a medical overview, resources for further information and support, and a sociologists’ view of MCS by Steve Kroll-Smith, director of the Environmental Social Science Research Institute, University of New Orleans. Includes photographs of persons whose lives are described. This book is written by a Seattle counselor living with multiple chemical sensitivity (MCS). She presents her interviews with 32 people coping with this life- impacting syndrome in different regions of the US and Canada. Each interview is accompanied by pictures which adds to the impact of the individual's personal story. In one interview a sufferer's spouse adds his perspective which offers important incite into how multiple chemical sensitivity affects the people close to the sufferer. This is a great book for people thinking they are alone in the nightmare of MCS. The book demonstrates that there are so many others out there in a similar situation and shows how they are coping with life as an MCS sufferer. Appendices include an overview of MCS, a sociologist's viewpoint, resources for support, and recommended reading. This is undoubtedly the most personal look at MCS I have read and as such I found it very enlightening. This book is sure to give hope and comfort to MCS sufferers.